To counter this, the Department of Defense (DoD) is moving on several fronts to protect and secure its SATCOM infrastructure. This article looks at one notable program making progress, the Enterprise Management and Control (EM&C) system. This U.S. Air Force (U.S.A.F.) initiative is developing a newly defined SATCOM architecture that will enable DoD SATCOM users to dynamically access diverse satellites, service providers and gateways in an operationally relevant time frame, typically in minutes. Today, the vast majority of DoD SATCOM use either the Wideband Global SATCOM (WGS) system and/or various commercial satellites that are highly susceptible to interference. However, current SATCOM infrastructure and processes weren’t design to allocate SATCOM services on the fly when encountering threats or disruptions. Switching users to alternative services or networks requires bureaucratic and manual processes that are slow and cumbersome, taking days, weeks, or months to procure and set up. EMC’s breakthrough roaming capability, akin to the automated switching that occurs (invisibly to users) across multiple cellular networks, protects SATCOM access through path diversity, providing unprecedented agility to theater users in working through interference and outages. 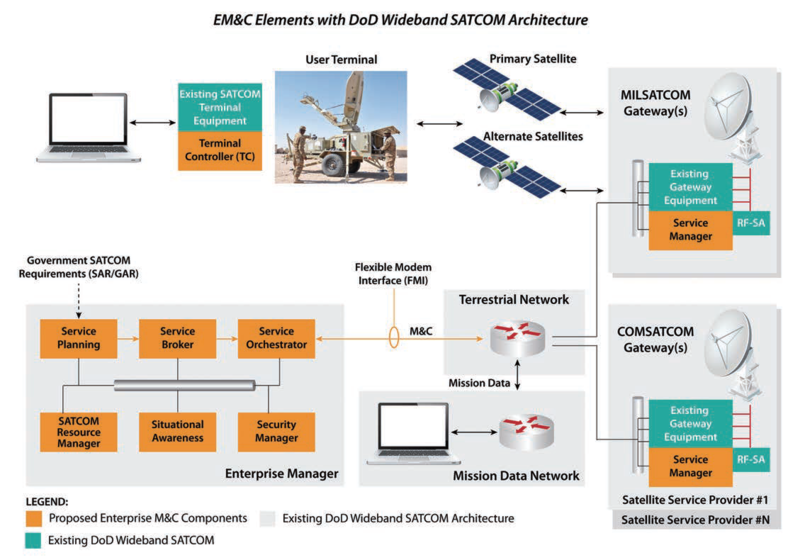 Equally important, EMC’s architecture will allow the DoD to inexpensively update the vast majority of its current wideband SATCOM terminal infrastructure, which includes thousands of existing field terminals. Using EM&C software, DoD can leverage this extensive investment without replacing terminal equipment. EMC works by combining flexibility at the terminal with enterprise components that determine why, when, and how the system should roam and transition. By monitoring the RF environment and impacts to performance, its system logic determines best available SATCOM resources, coordinating and connecting users (on each end) as needed. Benefits include increased resilience to interference, jamming, or environmental affects, far more rapid resource allocation, improved situational awareness, and increased bandwidth utilization efficiencies. Figure 2 to the left illustrates the concept of a User Terminal experiencing interference on its primary network. EM&C functionality enables the terminal to have cognizance of other network options operating on alternate satellites, and automatically switch to the new network to avoid interference. The Air Force has continued to define details of the EM&C architecture over the past several years. These efforts have included funding a Pilot Phase 1 study, which solicited feedback from Industry on possible solutions and recommended architectures, followed by a Pilot Phase 2 effort, which funded several companies to demonstrate prototypes of the EM&C architecture. 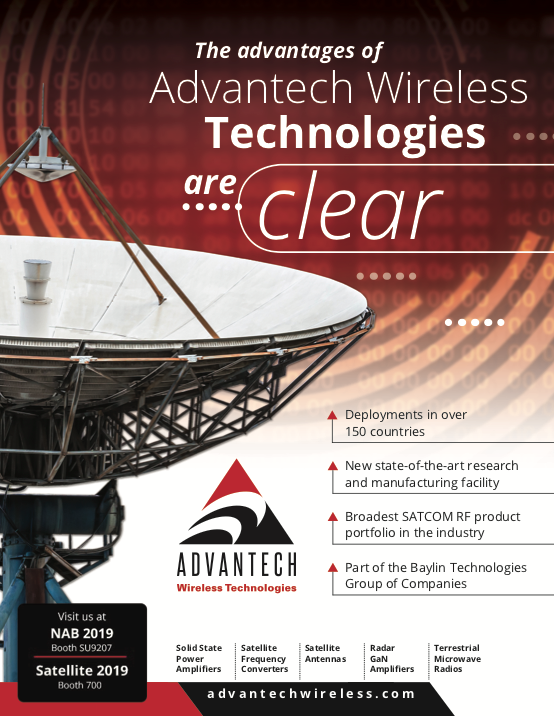 Successful demonstrations were then carried out in December 2018 and January of 2019, showing the ability to roam among heterogeneous networks, enabling secure SATCOM across multiple operator networks. This used a US government multi-band satellite communication terminal and gateway equipment representative of current (deployed) infrastructure. 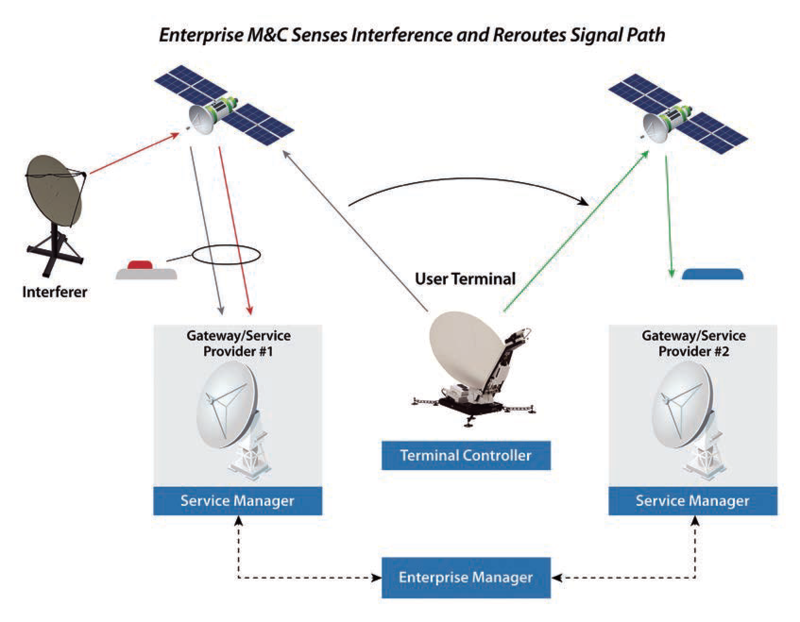 An application of these new EM&C capabilities to existing terminal infrastructure is illustrated in Figure 3 below. Note the Terminal Controller, Service Manager and all elements of the Enterprise Manager (in orange) are new; everything else leverages the current architecture. In Figure 3, terminals connect to other terminals and/or to satellite Gateways through a variety of satellites. Gateways that are controlled by the DoD, and provide Government-dedicated SATCOM resources are referred to as MILSATCOM Gateways. Those that are controlled by commercial companies and provide Government/commercial shared SATCOM resources are referred to as COMSATCOM Gateways. Terrestrial transport networks connect Gateways to networks supporting the DoD’s mission applications (Mission Data Networks). 1. The Terminal Controller configures and controls the user terminal equipment. It stores the required information even when the terminal is disconnected from the SATCOM network due to a failure or outage. Depending on the terminal model, a Terminal Controller can be integrated as a separate hardware module or as a software-only upgrade without any required modifications to other terminal components. 2. The Service Manager configures and controls equipment and resources at each COMSATCOM or MILSATCOM Gateway. Similar to existing terminals, equipment at the Gateways has management interfaces that can be utilized for control and to obtain situational awareness information. This Gateway control function talks to the Enterprise Manager, which has the master plan. a. Service Planning and Service Broker determines the plan: Ingests the Government’s Satellite Access Request (SAR) and Gateway Access Request (GAR) information (or their next-generation equivalents), and generates Primary, Alternate, Contingency and Emergency (PACE) SATCOM access plans based on available satellites and services. Collects or generates the required configuration information needed by the Terminal Controller and Service Manager. b. Service Orchestrator loads, configures and executes the plan. Communicates with Terminal Controllers and Service Managers to execute the desired terminal and Gateway configurations necessary to implement the selected options, and collect SA data. c. SATCOM Resource Manager: Tracks currently utilized and available SATCOM resources and keeps track of historical allocations. Provides trends and forecasts. d. Situation Awareness (SA): Collects and displays network status and event history including performance data, health and status of SATCOM links, SATCOM equipment, terrestrial network elements, and security data. Provides centralized view of network status and resource usage. e. Security Manager: Manages network access, provides cyber tools for network monitoring and other functions that ensure compliance with National Institute of Technology (NIST), Risk Management Framework (RMF) cyber security, and information assurance (IA) guidelines. 4. Flexible Modem Interface (FMI): The FMI presents a uniform interface between the many varieties of user terminals and the Enterprise Manager, allowing the population of user terminals. The proliferation of this open, government-sponsored FMI standard is key to enabling the vision of satellite and user-terminal interoperability. For existing terminals, the FMI is added as either a software- or lightweight hardware-based interface upgrade to provide the necessary management and communication functions. Centralized situational awareness provides a global view of network status and available resources. Flexible terminal control enables terminals to use these resources more efficiently and resiliently. Both support the overarching goal of bolstering communication superiority. The EM&C vision has been well-defined by the U.S. Government. Early risk-reduction efforts by Industry have shown that this vision is realizable, proving that minor modifications to existing government terminals can create the ability to seamlessly cross between commercial and DoD SATCOM resources of various types. 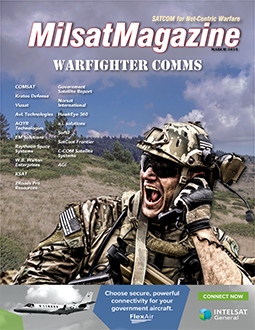 The concept has the potential to address many of the vulnerabilities and inefficiencies currently inherent in wideband SATCOM, and can be an important future tool for the DoD to effectively increase access and resilience for the warfighter operating in hostile RF environments, without replacing or adding new terminals. Dr. Mark Dale is the System Architect leading the EM&C effort for Kratos Defense, where he helps define next generation satellite communications solutions in support of the U.S. Government. His recent activities for EM&C have included support for the Pilot Phase 1 and 2 efforts sponsored by the Advanced Concepts Division of the Space and Missile Systems Center (SMC-MCX). Together with team members internal and external to Kratos, he has worked to define mechanisms to enable satellite terminals to flexibly access commercial and USG SATCOM capacity and roam between a diverse pool of satellites, teleports, and managed systems. Dr. Dale has been working in the satellite industry for over 20 years, with responsibilities that have spanned systems engineering, product management and business development. He holds a MSEE from the Georgia Institute of Technology, and a Ph.D. from the University of Southern California.